In my last entry, I wrote about the almost mystical prayer experience I had in Seattle’s gorgeous St. James Cathedral. I left there at about noon and continued my quest for good places to pray with beads in this quirky, lovely city. For some reason, I got it into my head that after praying indoors at St. James, I should look for a good place to try out my prayer beads outdoors. Seattle is not known for its fine weather, but during the time my husband and I have been here, the weather has been positively ideal – sunny, between 74 and 80 degrees and often with a light breeze. After all the smoky skies we’ve been having in the SF Bay Area, the weather in Seattle has been like stepping out into a cool, bright morning after a night’s debauch in a cigar store. 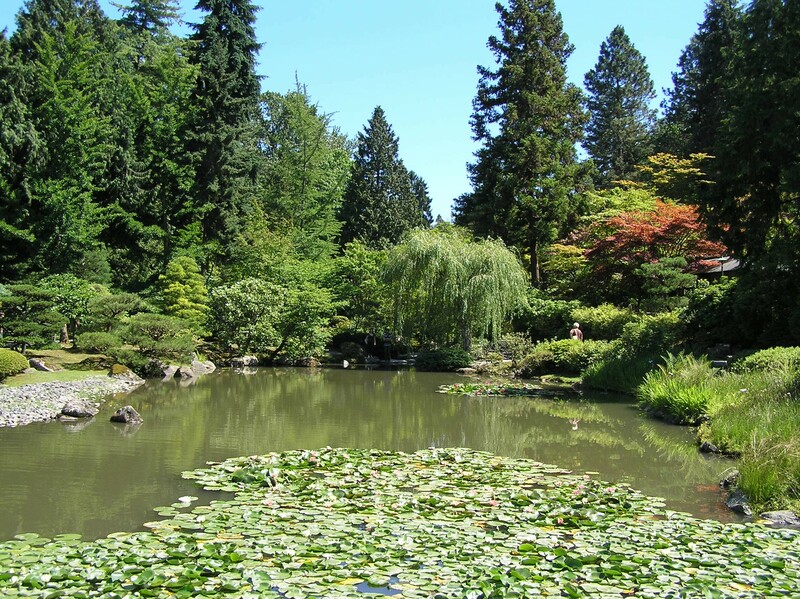 So, after looking at a tourist map the concierge gave me, I decided I could walk from St. James to Seattle’s Japanese Garden. Surely, once there, I would be imbued with the meditative, Buddhist spirit of the place and be moved to pray. I walked. And I walked. And I walked and I walked and I walked. With every step, I think a lost a little of transcendent mood I captured at St. James. By the time I stopped for some lunch in a neighborhood called Capitol Hill, I thought I must surely be within a block or two of my destination. WRONG AGAIN! It seemed that the tourist map crunched the perspective on the areas of the map outside Seattle’s downtown, because who, in their right mind, would want to venture beyond the Space Needle, Pioneer Square and the culinary lure of Pikes Place Market? So instead of a few blocks, I still had more than a mile. UPHILL. Okay, so after a slice and soda, I set off. Soon I was walking on some pretty tree-lined streets with what I would call mansions on either side. The homes were definitely older – maybe from the 1920s or so – and some had four floors! All were gorgeous and I would dearly have loved to peek inside the humblest of them. After i don’t know how many blocks of this, I came to Volunteer Park, home of the Seattle Asian Art Museum. Asian art. Right. That goes with Buddhism. So I decided to stop there, draw some inspiration from looking at some Buddhist art before getting some more directions to the Japanese Garden. Asian art is not my favorite. But as I was getting warm and needed a bathroom (soda – must remember not to guzzle soda when not working within steps of my bathroom) I eagerly stepped inside. And I am rather glad I did. The Museum – which is part of the Seattle Art Museum – was hosting a show called “Discovering Buddhist Art – Seeking the Sublime.” The show offered a great introduction to Buddhism, describing all the major stories about the Buddha and how the religion/philosophy spread across Asia. It had lots of statuary depicting Buddha as he is imaged in different Asian cultures, and I was on the look out for representations of him carrying malas, the Buddhist and Hindu form of prayer bead. Several of the statues of the Buddhas held little malas in their right hands, some while seated with their consort goddesses, others while crushing demons with their hands and feet. All the Buddhas and other figures in the show wore the most serene expressions on their faces, reflecting the immeasurable peace attained by true detachment from all wordly thing. 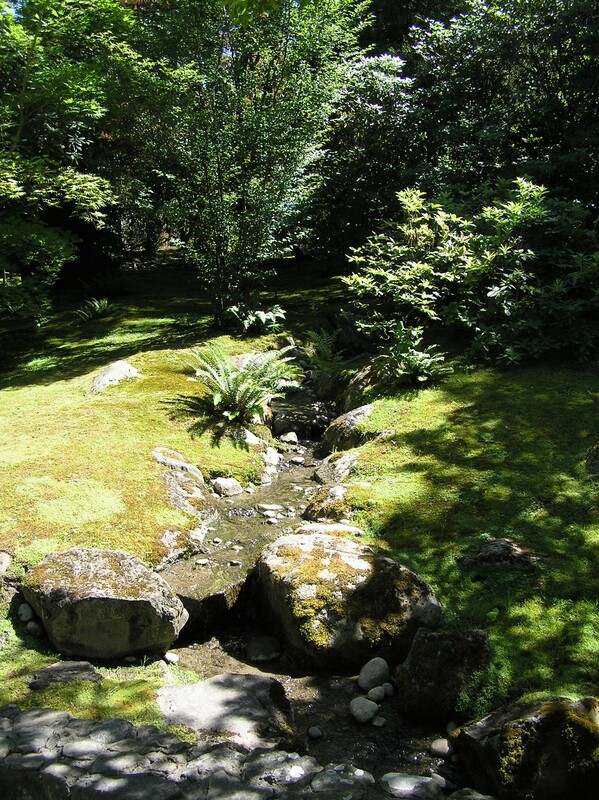 Ah, yes – that reminds me – back to my quest for the the Japanese Garden where, I too, might find such detachment. I set off one more time, still almost a mile away from my destination – and with one more major hill to climb up and over. But, like any spiritual quest, it isn’t the destination, but the journey, and my journey through the Capitol Hill neighborhood was one of the highlights of the day. 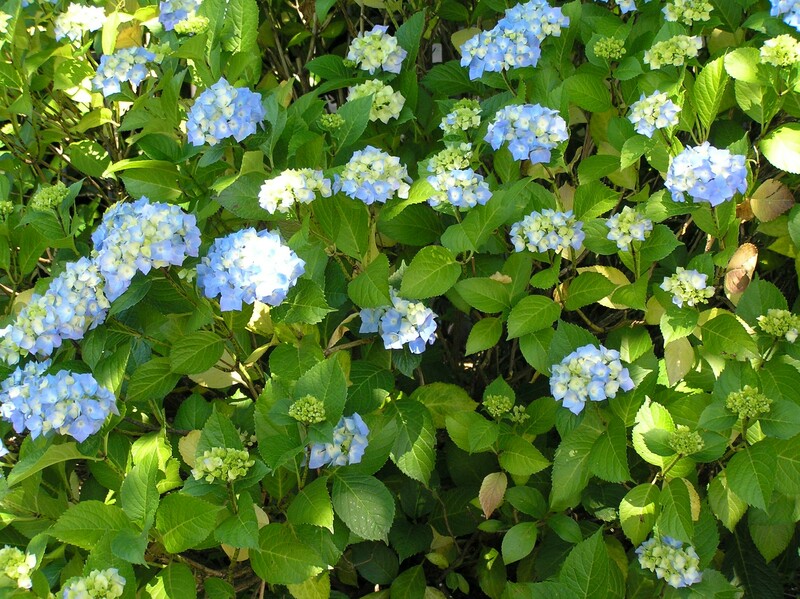 As I have been all week, I was stunned by the vibrancy of the flowers in this town – riots of hydrangea, roses, peonies, marigolds, poppies, pansies, fuchsia spring from the smallest garden plots and from hanging baskets that seem to be a totem of this city. And at the top of the hill, I was rewarded with a view of Mt. Ranier, snowy and cool and remote, some 90 miles away from the city. And someone who lives on Capitol Hill has a sense of whimsy. As I walked by this one big house, the yard was decorated with “art” – painted cowboy boots, stone towers and the like. 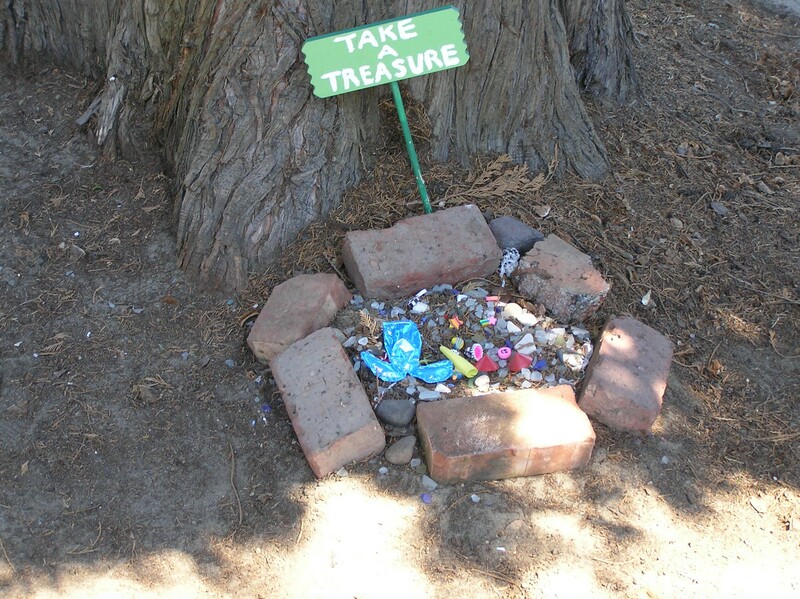 At the foot of a tree in the yard was a collection of little trinkets – sea glass, little dolls, balls, etc. and a sign that said “take a treasure.” I did – a piece of sea glass! Downhill, downhill, downhill and then – at last! 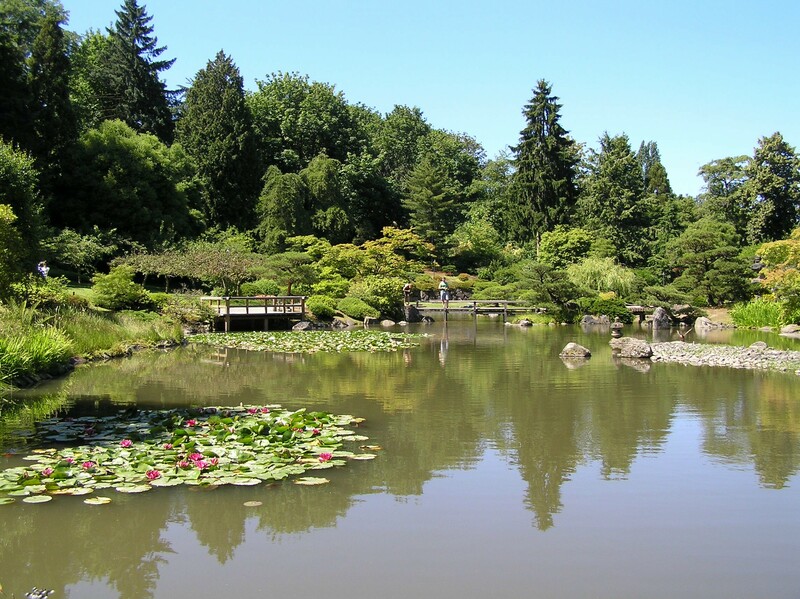 – the Japanese Garden. But I think by this point I was just too darned tired to be inspired anymore. All but three of the park’s benches were in full sun at this time of day, so I couldn’t find anywhere to sit and be alone. But I took some pictures and I show them to you here so you can see that if you do come to Seattle and you are looking for a good outdoor place to be alone with your thoughts and prayers, this will do. It is a little close to Lake Washington Blvd. for it to be totally quiet, but it has lovely waterfalls and brooks that spread the soothing melody of bubbling water throughout. This is a brook that runs through the garden. You can sit on a rock or under a tree or on a bench – if you can find one not in the sun. And here’s a shot of the pond – that the brook runs into – looking across to a set of bridges. There are big goldfish in the pond (I don’t think they are koi) and some turtles that come up and sun themselves on the rocks. Dragonflies dart among the waterlilly blossoms. This is a shot of the pond from the bridges pictured above. It is nice a cool under the willows and that would me a nice place to meditate or pray. 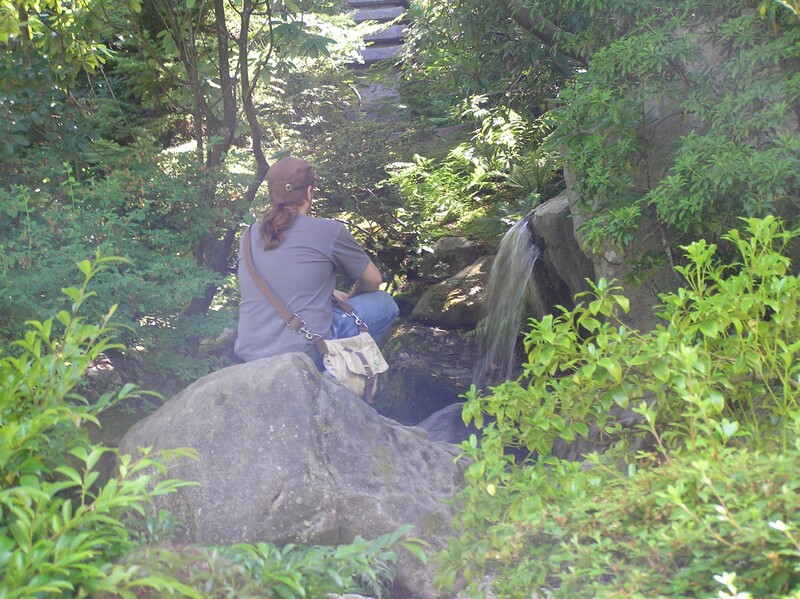 And here is a guy who is doing what I had hoped to be doing – meditating or thinking or praying – before the brook. I am happy he found a good spot. COULDN’T FIND THE INSPIRATION TO MEDITATE OR PRAY?? Then I did something smart. I caught the bus back to the hotel, bought an iced coffee and put my feet up. In my next post, I’ll give you a review of a couple of Seattle bead stores I frequented and I’ll tell you about one or two more places I visited for prayer.